We live in a world where we use technology to make almost everything in our lives easier. We set alarms on our cell phones, we ask our Google Home what the weather is, and we use apps to start our cars when it's cold out. All of these things can benefit every member of the family, but what about our furry family members? That's right, pet tech is real, and it's constantly evolving, just like our tech is. Many pet owners know the look we get from our pets when we walk out the door every morning. It's totally heartbreaking. Luckily, with the growth of pet tech, there are now options to basically be "with" your pet, or at least keep them entertained 24/7, so that they are never truly alone. It's 6 am on a Saturday, and your dog is crying at the foot of your bed to go outside. You begrudgingly get up out of bed, slide on some slippers, and groggily make your way to the door to leash up your dog and let him outside. It's an unfortunate side to being a dog owner, but thanks to PetSafe, those early morning whines are a thing of the past. 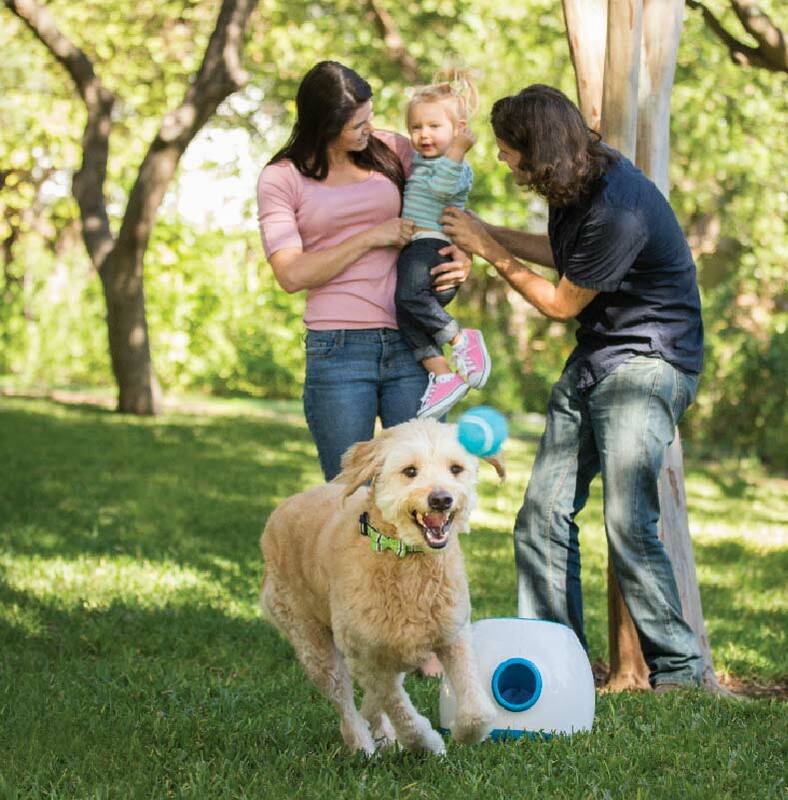 Dogs seem to always have to go outside at the most inconvenient times, but the PetSafe SmartDoor is the solution to all of your pet's poorly-timed potty problems. 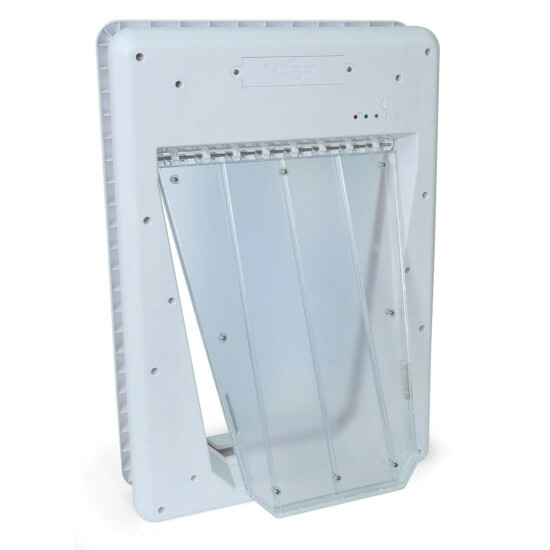 The SmartDoor installs onto any door that leads outside. Simply remove the door from its hinges, measure the proper height, and cut a hole where the SmartDoor will stay. Then, program up to five "SmartKeys" that will attach to your dog's collar. When the dog wearing the SmartKey is in range, the door will automatically open and give them access to outside. Cat owners know their kitties love swatting at shoe strings, bugs, or even the occasional glare from a moving reflective surface. It's no surprise that app developers have decided to capitalize on kitty gullibility. The apps all feature tiny moving animals that your kitty can swat at on large tablet screens. Once an animal is hit, it will make a noise and then disappear. My cat's two favorite apps are Cat Fishing 2 and Mouse for Cats. 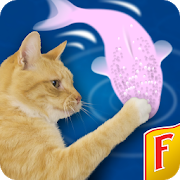 Cat Fishing 2 is brought to you by the famous cat food brand and cat experts Friskies, so it's no surprise the cats love this game. The game features colorful fish swimming in water with peaceful noises playing in the background. Once a fish is tapped, the app makes a droplet sound, showcases some ripples on the water, and the fish swims away, only with another to appear upon the initial one's disappearance. This app also has a timer and different levels, so your kitty can level up like a true gamer. The second app my cat loves is called Mouse for Cats. 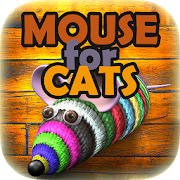 This app is similar except it features toy mice scurrying across a floor. Any tap on the screen makes an annoyingly-cute squeak sound, and if the mouse is hit, it scurries away faster. There is also a Hit counter so you can know how well your kitty did. Both apps are free to download on both iTunes and the Google Play store. Ever wondered if your dog is actually being a good boy while you're grocery shopping? Ever wondered if your cat is staying off of the forbidden countertop while you're at work? Well, now you can know. 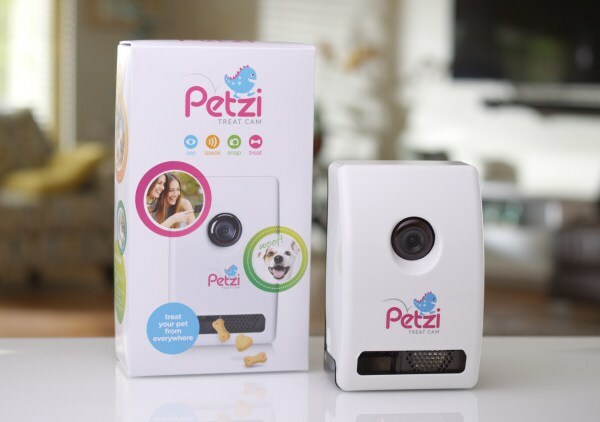 The Petzi Treat Cam is not only an app-controlled, WiFi-connected camera, it's also a treat dispenser. With the tap of a button on the Petzi app, treats will be dispensed to your pet, and you can watch them gobble them up with delight through the wide-angle camera. Didn't leave a light on for your pet? No problem. The Petzi camera is equipped with night vision, so you can truly see your pet at any time of the day. And if you're missing an adorably cute moment when you check in, the app also allows you to capture photos, so that adorable back scratch can be saved forever. Do you have a kitty who loves to explore? Do you ever worry about where your kitty may be exploring? Have you ever had a night where your cat didn't come home, and you started wondering if you should start hanging lost pet flyers? For many indoor/outdoor cat owners, these are very real concerns. While there have been quite a few companies who have come out with pet tracking devices, one seems to consistently have the most praise. The Whistle 3 GPS Tracker & Activity Monitor has risen to popularity with its beaming reviews, coupled with an affordable price. It features a battery that can last up to seven days and only takes two hours to charge, a subscribtion plan that starts as low as $6.95/mo, and a trip monitor that allows you to track your pet's location over the last 24 hours. Perhaps the best feature about this gadget is that it alerts you (via text, app, or email) if your pet is leaving a pre-set "safe place," so you can get to your pet before they get too far away. If your good boy wants to play ball but you are totally not feeling it, have no fear. The iFetch Interactive Ball Launcher is here. While many other ball launchers fell short of expectations, this one continuously gets rave reviews. The iFetch comes with three mini tennis balls that measure 1.6 inches in diameter, though you can always buy more balls here if necessary. It is also incredibly easy to use for both dogs and humans. Humans simply plug it in or insert 6 C cell batteries and push a button on the iFetch to set the throw distance (either 10, 20, or 30 ft). Once the ball is launched, all your dog has to do is retrieve it and drop it back into the funnel, all for the fun to repeat over again! If your work schedule is somewhat erratic, then this is the gadget for you! The PetSafe Eatwell 5-Meal Automatic Pet Feeder keeps your pets on a consistent feeding schedule when your schedule is inconsistent. The pet feeder has five, 1 cup portion sized slots that can be filled with either wet or dry food and is removable so you can pop it right in the dishwasher for easy cleaning. The feeder also features a digital display so its incredibly easy to set the perfect feeding schedule for your cat or dog. Lastly, the feeder comes with a 1-year non-transferable warranty so if it breaks, you can easily get it replaced with a new one. 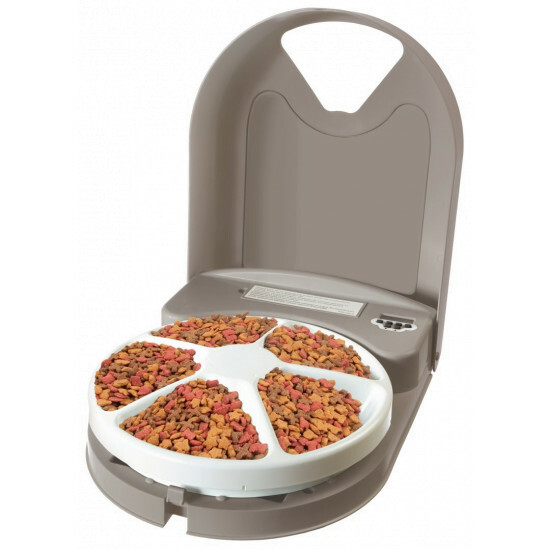 The Pet Feeder can also be found listed for as low as $49.95, so its convenience makes it easy on your mind, and the price makes it easy on your wallet. Give some of these gadgets a try, and let us know what you think on our Facebook or Twitter!